By now you have probably at least heard about Shimano’s Di2 (digital integrated intelligence), a shifting option to the company’s proven mechanical shifting. But unless you’ve actually spent time on it, the important concepts of programmable electronic shifting may be hard to grasp. Instead of mechanical cables, Di2 is an electronic gear-shifting system that enables riders to execute shifts with electronic switches vs. mechanical shift levers. Through the use of Di2, shifts are fast and precise with countless customization options. The most important thing to remember as you watch these videos and read more is that the user is always in control of what your system does or can be pre-programmed to do. Whether you use a 1×11, 2×11 or even if you still love your 3×11 drivetrain, Di2 technology for mountain bikes gives riders from all disciplines and preferences the same core benefits. 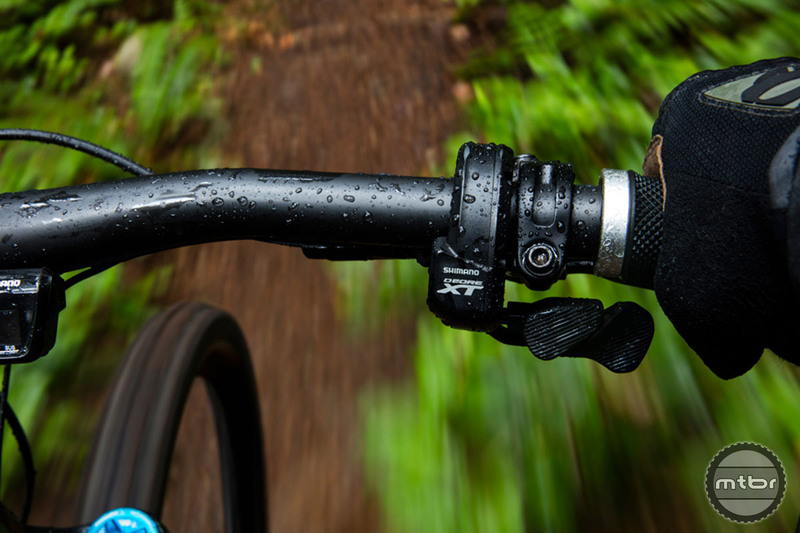 Electronic signals between the shifter and the derailleur(s) give mountain bikers an instant connection to a wide range of gears, making it easier to react and stay in the flow of the trail. React instantly to sudden changes on the trail quickly and efficiently allowing you to save energy or find more speed. With Di2 you can pre-program the system to shift through your whole cassette by simply holding down the shifter. Or if you prefer a traditional approach, tap away every single shift. Additionally, there is no exposed mechanical cable and housing to add friction, be susceptible to contamination, or wear out. With Di2’s electronic signals and its sealed system, shifts are powerful, dependable, and instantaneous. Synchro Shift is the kind of thing you don’t completely understand until you try it. It gives riders the simplicity of 1×11 drivetrain, with the gear range and gear steps of a 2×11 drivetrain by utilizing a single gear shifter (or two shifters if you prefer) that can control both the front and rear derailleurs through programmable gear mapping. Synchro Shift’s advanced shifting technology allows you to program and execute multiple commands of your choice, with a single shifter. Not only do you choose when the front derailleur shifts, you can program simultaneous rear shifts to maintain cadence and momentum. However, if you’d like a left shifter, it can be used as well. It would allow you to manually execute a front shift whenever you wanted, but most riders don’t find that necessary. Synchro Shifting allows you to program and execute multiple commands with a single shifter. Synchro shifting can be a great help for a wide range of people, but please don’t just think of it as something for people who don’t know how to use the gears on their bike. World class racers that are riding at the limit of their ability are often so far into oxygen debt that it becomes easy to make a mistake. Synchro shifting takes the possibility of rider error out of the equation when using a 2×11 system. Of course, since its Di2, the Synchro gear map is fully customizable. There are even two Synchro modes which come out of the box tailored towards mashers or spinners. If you want to experiment you can make adjustments in the E-Tube Project software and switch between two settings on the trail to compare them. Like paddle-shifter automatics in a car, this too is silly and lame. At least in a car, it makes sense for someone with disabilities. “Automatic vehicle Paddle shifter” were designed by Ferrari for their F1 race carts. They eventually spilled over into production Ferrari models. Cadillac licensed the technology and put it in some models in the early 2000’s, but no longer use the tech. “Paddle shifters” were designed with one aspect in mind, make shifting easier and provide the drive more safety by keeping both hands on the wheel, never having to remove a hand from steering to shift. The Di2 shift system is similar, that it helps remove the brains focus on shifting so the (human)brain can focus more on the obstacles in the trail. It’s really more of a racers component than a component for casual riders; but make no mistake, there will be Stravars that pick up this system to improve their social KOM’s. The Di2 system “being silly” is rather an opinion from non-prfessional-racers. I’m not a pro-racer, so the Di2 system does not excite me, or have me saving to buy in. Though, my Enduro racer friends who have bought in swear that their segment times have increased. I will never even ride a bike with cables and housing! Rod brakes and rod shifters are the proper way and what a bicycle should be. Electronics are magic made by the devil..
Great. A small step overall but improving things. Not that I care for 2x drivetrains anymore. Syncro-shift is really the big deal here IMO. I have been riding 1x now for almost 2 years and I will NEVER go back to a FD. The biggest bane of cassettes and derailleurs though is that you can’t shift under load. Only internal gearboxes could solve that as far as I know, and that would be the ultimate end-goal of any bicycle with gears (as far as shifting or drivetrain goes). No-load shifting would really improve things a lot, not to mention less wear and tear and no more hangers or derailleurs to get bent or snapped off.